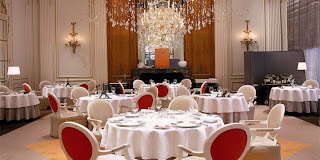 Dinner at Alain Ducasse at the Hotel Plaza Athenee is, by far, the most extravagant meal I have ever or will ever eat. The wine! the cheese! the caviar! the desserts! even the butter! A full explanation of our menu would be too much for this little blog, but I will mention my favorite dish- langoustines with heaping dollops of caviar and a delicate lobster broth. This was just the amuse bouche and an indication of the quality and intricacy of the dishes to follow. The legions of staff were attentive and service was flawless. The cheese garçon was especially impressive, thoroughly explaining every offering on the overflowing silver cart. If you go, request a table by one of the courtyard windows facing in towards the center of the room. You'll see the Plaza Athenee's impeccably planted interior garden over one shoulder and have a prime view of the rituals of Parisian haute cuisine in the sparkling dining room.